Australia is notoriously an expensive country to travel in, especially for backpackers who have been tramping around South East Asia for a few months before arriving. I guess this is what makes the working holiday scheme so inviting; The opportunity to travel and then sooth your weeping bank balance with a well paid casual job. There seems to be no escape from the expense of Australian travel; Prices are high in outback towns because getting any produce to these remote locations is a pain in the arse, city prices are even more extortionate and buying a pint means taking out a mortgage, while the touristy areas capitalise on the opportunity to drain enthusiastic day-trippers of every cent. So finding free stuff to do becomes not only a fun challenge but also a kind of necessity. With that in mind, here are a few free or practically free things you can do along the East Coast of Australia! 1. 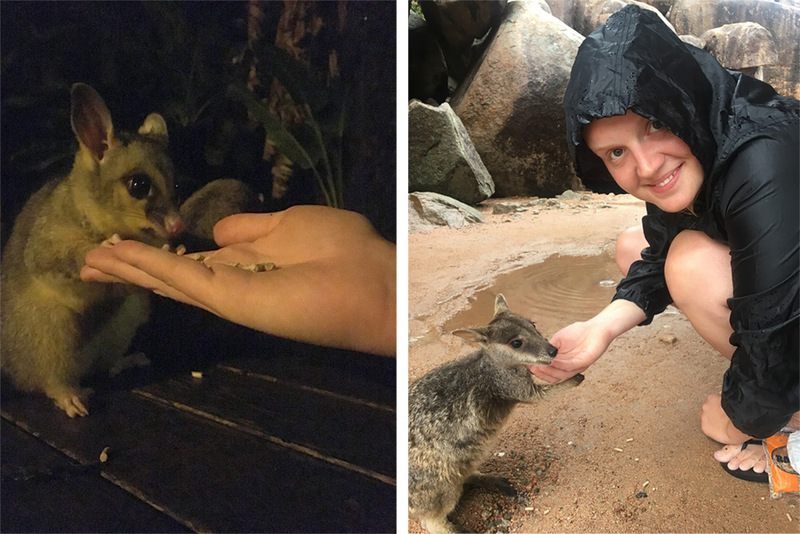 Feed wild wombats and parakeets on Magnetic Island: Just off the coast from bustling Townsville, Maggie is full of wonderful wildlife experiences. Bush walks where spotting koalas is pretty much guaranteed, hostel rooms where possums make late night visits and snorkel spots teeming with fish makes this island a wildlife haven. Head to Geoffrey Bay with a $2 bag of feed (available at the YHA and other shops) and rustle your bag until a curious wallaby hops down to feed straight from your hand. With little fresh water on the island the wallabies get much of their hydration from the food they consume so often just a cup of water will do the trick. It is important however to mention that you must never feed the wallabies human food, whilst we were leaving a group of over eager Australian tourists were about to feed a wallaby an oreo before we offered them some of our left over feed. 2. Bull Riding practice in Rockhampton: PBR (professional bull riding) is an iconic Australian sport. The aim of the game is to hop onto an aggravated bucking bull and attempted to stay on, with only one hand to support yourself for a whole 8 seconds. There’s little doubt about the animal cruelty factor of the sport; A strap is pulled tightly around the bulls abdominal area which makes it buck uncontrollably in a futile but desperate attempt to rid itself of the constriction. If you’re happy to overlook the questionable ethics of the sport for a one-off cultural Aussie sporting experience its worth heading to the Great Western Hotel in Rocky to watch a practice session. Riders as young as 11 hop onto bulls and attempt to stay onboard. With an arena style seating area you can bypass the bar and just watch for free, or if you’re feeling plush get a couple beers in and a prime steak in the place regarded as ‘the beef capitol’ of Australia. 3. If animal cruelty isn’t high on the agenda, head to Rocky’s Botanical Gardens: Lounge around the lake while curious parakeets blatantly attempt to steal your lunch. These free-to-enter Botanical Gardens are dotted right the way up the East Coast (Brisbane, Rocky, Mackay, Cairns to name a few) and are a great place to chill out for the day. Most also have a cafe/restaurant and often boast either another attraction alongside or hold events such as craft markets on weekends. Take a book, grab an ice cream with the money you saved and spend a couple hours wandering aimlessly around lush tropical gardens. I shamelessly fell asleep under the shade of a palm tree for 2 hours up in Rocky’s gardens; It’s a hard life this backpacking. 4. Go for a swim: Forget paying for swimming like at home, a lot of seaside cities have lagoons where you can wallow on the manmade beach and cool off in the danger-free water. 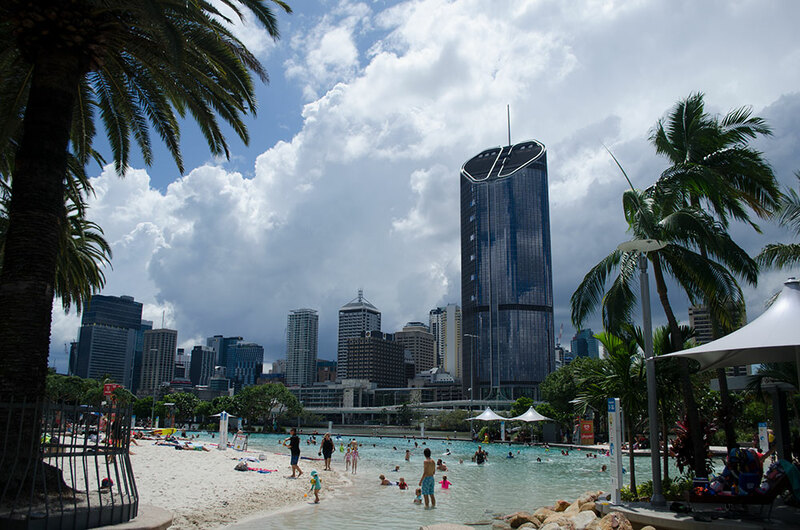 Brisbane, Airlie Beach and Cairns all boast these free swimming spots but its best to avoid them at weekends and school holidays, unless you’re keen on a barrage of constant splashing, floating plasters and incessant screaming. Even better than the free lagoons is the actual ocean. You’re constantly told that swimming in the ocean in Northern Queensland is a fools game because of the risk of crocodiles (and in season killer jellyfish) but most beaches have designated netted areas for swimming and the locals are usually always up to date with recent sightings and the impending arrival of jellyfish. 5. Whale watch from the beach in Mooloolaba: This part of the East Coast is world famous for its whale watching and you don’t need to pay for a boat trip to see these magnificent mammals. For a start, they are huge (up to 16 metres and about 30 tons) which means they’re even impressive from a distance. Set up for the day with a packed lunch at Point Cartwright and wait to see what comes by. Patience is key when it comes to this type of wildlife watching, but sitting out in the pleasant 25ish degrees that the whale watch season provides with a beautiful view alone the Sunny Coast is hardly strenuous. 6. Watch the flying Foxes come in to roost in Hervey Bay (and lots of other locations on the East Coast). These bats boast an absurd wingspan of up to a meter (3.3ft) and can weigh up to a kilo. Their name is so apt. The flying fox’s furry dog-like head protruding from its angular Halloween-esk cape really accentuates its mammalian order and is oddly quite adorable. Head down to the Pialba leg of the Hervey Bay esplanade just before dusk and wait for the raucous show to begin. There’s a small area set back slightly from the road with an information board and seating area for you to enjoy the spectacle comfortably. However, I opted for lying on the grass to watch the bats fly overheard in their hundreds. If you’re more of an early bird, head down at dawn and watch the trees come alive as they come in to roost. 7. 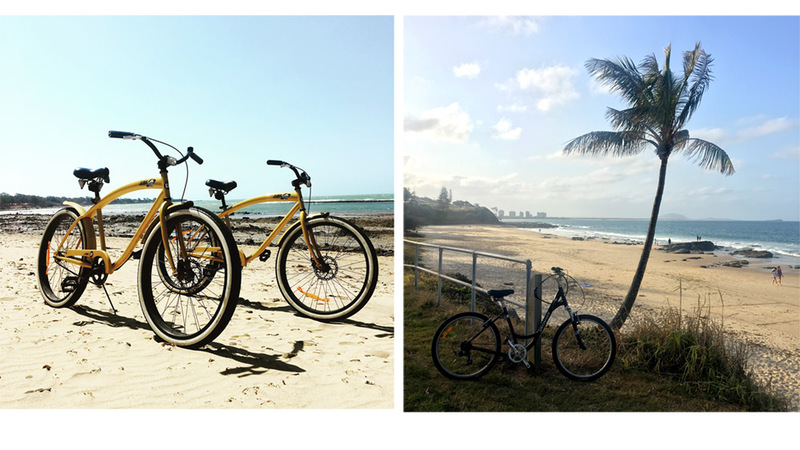 Hire a bike in Agnes Waters and cycle to the Town of 1770 to watch the sunset at one of only three points along the East Coast where you can see the sun set over the ocean. The sleepy little town hosts loads of hostels that also offer bike rental for next to nothing, as do many along the East Coast. The most I paid anywhere was $10 for the whole day. The esplanades in the cities and towns are perfect for a nice easy-going, scenic cycle and you can google further routes if you’re up for a more strenuous ride. 8. Grab a snorkel mask and explore North Stradbroke: If you’ve got room in your rucksack to carry a mask its definitely worth buying one, although you can rent them at most hostels for a few bucks. Just a couple of meters off loads of the East Coast’s beaches a whole new world of weird and wonderful fish are waiting to be spotted. Theres hundreds of snorkelling trips you can pay to do, many of which are well worth the cash, but with your own snorkel you can turn a quick splash around in shallow waters to a David Attenborough worthy experience. Its incredible what you can see in waters no deeper than half a meter, literally just a few steps off the beach.